The first American to return from space was female, and is buried in Huntsville, Alabama. 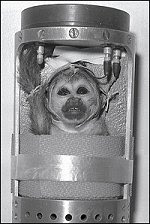 The gravestone reads: "Miss Baker, squirrel monkey, first U.S. animal to fly in space and return alive. May 28, 1959." More than 300 people attended Baker's funeral service when she died of kidney failure in 1984, Buckbee says.